I was recently contacted by a guitar player who wanted an MS encoder for live performance similar to the CenterPoint Space Station. A Mid Side speaker array is analogous to an MS mic setup with "L" and "R" (if you can call it that) reconstructed acoustically from Mid and Side speakers. The power amplifier inputs are fed Mid and Side. The Aspen Pittman CenterPoint system and Ted Fletcher Orbitsound system use either two or three speakers. Centerpoint's speakers are at right angles. The Side speaker is a dipole open-back radiator. The CenterPoint and Orbitsound systems are said to have a very large ambient soundfield with a wide "sweet-spot." The room is very much a part of the acoustic reconstruction. I quickly realized that the Mid Side Width Controller shown here would be ideal. This particular Width control implementation allows full attenuation of Mid or Side on a counter-rotating pot. It can pan from full Side, with no Mid, to full Mid with no Side. For performance or "monitoring" applications only an MS encoder section is needed. The inputs are L and R; the Outputs M and S.
Monitoring applications are discussed in both the speakerplans.com forum and the AVS forum. I've posted references to this forum on those sites because there really isn't much published about Mid Side speakers. I couldn't wait to try it out. I decided to first try a three speaker array since the Minimus 7's are sealed boxes. To duplicate a dipole Side radiator I needed back-to-back cabinets. I placed the mid speaker pointing towards me. The side speakers were back-to-back at right angles to Mid and wired in opposite polarity. As one speaker moves "east," in an outward direction, the other speaker also moves east in an inward direction. Mid Side Speaker Array on the workbench using Minimus 7s. 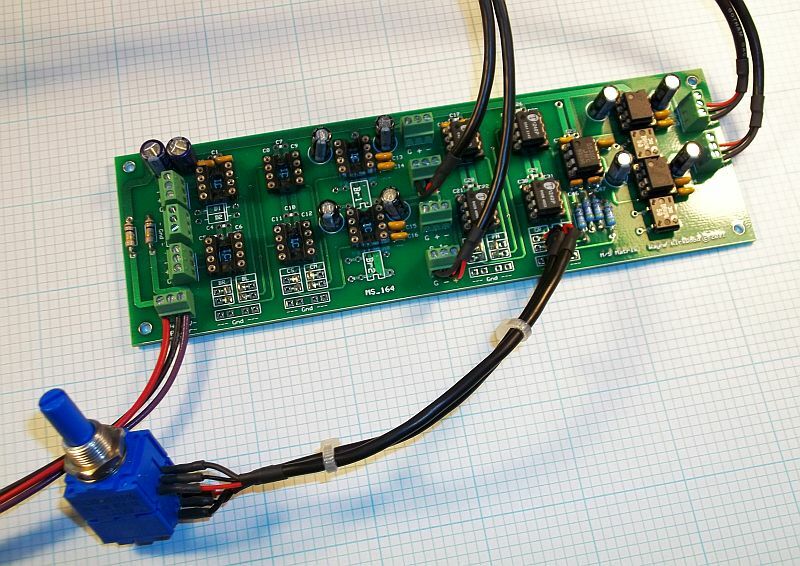 The MS Matrix decoder is used as an encoder. The MS "decode" section is modified with pots inserted into point "G."
The decoder is then made an encoder by simply re-labeling the connections. Left and Right feed the "M" and "S" inputs; the "L" and "R" outputs are the Mid and Side outputs. Use the decoder as your encoder. The Left and Right Inputs are at "E." The PC board point marked "GL" (G Left) becomes "GM" or G Mid. "GR" becomes "GS" or G Side. Add a two section 10K linear pot at insert point "G." Wire the pot so that at CW rotation mid is at full, side attenuated. Full CW rotation is zero width (Mono), full CCW is full Side. MS with variable width added. I reversed the rotation of the pot from the original so that full CW rotation is Wide. The feedback and input resistors around U9 were made 49K9 to load the pot lightly. The finished board looks like this. MS Speaker Encoder with Variable Width. Good enough for me to build a second one for myself. In a normal Left/Right speaker array hard left and right are clearly defined points. Mono is only a clearly defined point if you are "in the zone" and the monitors image well. A Mid Side speaker array is completely the opposite. There is no Left/Right imaging - only ambient space. Mono is a point: Stereo is an "area." A very, very big wide-open area. In a room it's awesome. The 300 degree coverage of the CenterPoint is real. I had the same idea as the AVS poster that this would make a nice ceiling cluster in a room you wanted to fill with ambient sound. I can see a four speaker 360 degree array with two Mid and two Side speakers. You wouldn't want to mix on this, but for casual playback I love it. Lots of material sounded good. Some was scary good. Transient mono elements in mixes pop in this system. They literally jump out at you. For the performing musician this offers some unique opportunity. Play rhythm parts in wide "stereo." When it comes time to take a solo stand by the cabinet and punch up mono bypass. The ears will focus the eyes on you. I heard stuff panned center in mixes I'd never noticed before. Like I said: Mono transients pop. It's the weirdest thing. The only downer is that FM radio is completely unlistenable because the L-R subcarrier's fragility makes every bit of multipath and synchronous AM noise audible. On FM Side can be noisy and distorted. I almost never listen to FM at home anyway so that's OK.
Ditto for crappy WMA audio with swimming L-R. The system does cry out for a sub-woofer. As you make stuff wider, by reducing Mid, a lot of the low frequency energy centered in the mix gets attenuated along with it. Crossing Mid to sub at low frequencies before the Width control would seem to solve its bass-shyness. With clean material you can get lost in it. I have not heard a system like this yet. I vaguely recall an attempt by one consumer hifi company (dbx?) to offer a stereo speaker system, that promised a much larger sweep spot listening area for the stereo image. Their gimmick (or theory) was to point the two speakers over toed-in towards each other instead of direct at the listening room sweet spot. When midway between them both speakers were equally off axis, and at same distance so the stereo image was centered. As the listener moved Left or Right (s)he becomes more on-axis with the speaker (s)he is moving away from so there could be a first order correction or at least a reduction in the loudness change. An interesting theory based on loudness, but ignores completely the arrival time differences that will localize sounds at the closer speaker. For relatively close spaced speaker pairs the arrival times may fall in the fusion region so be ignored. This approach never gain traction with consumers and faded away pretty quickly so there probably wasn't much there, there. 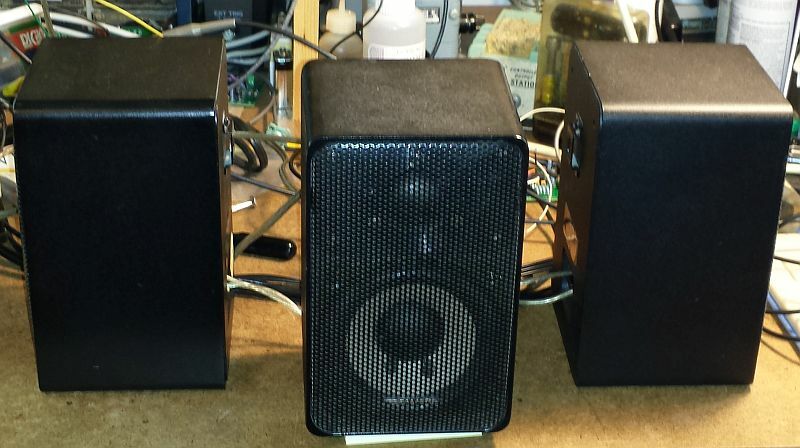 Interesting article by Reid Woodbury on an MS Speaker system he did in 1989.